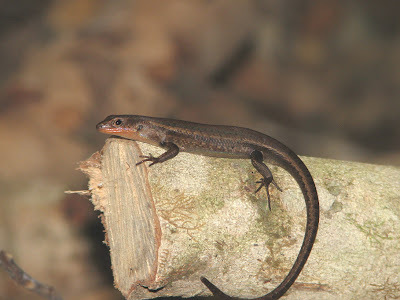 The Shade Skink, Saproscincus basiliscus, looks like any of a number of small skinks you see amongst the leaf litter. It measures about 4.5 cm snout to vent length. What is different about it is that it always sleeps on leaf surfaces about 50 cm from the ground. There must be some protective value in this strategy, but what it is I have not determined. Perhaps, there are ground marauders that it avoids with this technique. What id does do is to keep it out of the realm of the Cane Toad, Bufo marinus, which patrols the ground each night in search of anything it can subdue. 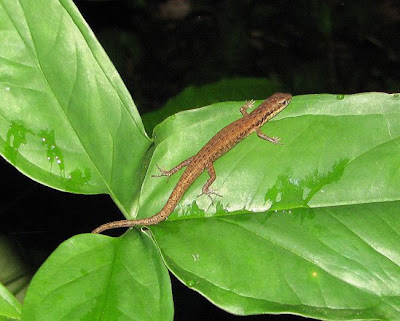 Small lizards are often eaten along with frogs and a wide variety of insects. A word about the big boys. 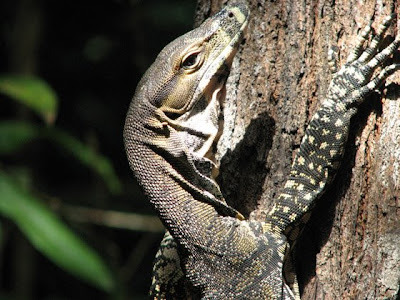 The Lace Monitor,Varanus varius, is a common resident in rainforests. It is a member of the group of lizards known in Australia as "goannas". This is a perversion of the word "iguana" so-called by the earliest Australian settlers. This lizard is at home on the ground as well as in the trees where it feeds on anything it can subdue. Birds, lizards and small mammals are taken. It lies in wait and unsuspecting Musky Rat Kangaroos bumble into the jaws of these monsters. A full grown Lace Monitor can be over 2.1 m long and have jaws measuring 12 cm. There are lots of stories about Lace Monitors. They often hang around campgrounds where they learn that there is food. They have an excellent sense of smell and if they get a whiff of something they want, almost nothing can deter them. I have seen them enter tents and tear the place up looking for food. I have heard stories of them taking sandwiches from the hands of startled picnickers. They have relatively poor eyesight and have been known to "run up a person" when danger threatened probably mistaking the person for a small tree. Our big Monitors have blunt tails. I was fortunate to see why one day when my camera was not at hand. The Brush Turkeys hate these lizards because they will dig up their mounds looking for eggs. Once they start, they are usually not deterred. When the turkeys find a wandering Monitor, they bite the tip of the tail always staying out of the range of the mouth and claws that would surely spell their end. When the tails are long and slender, pieces are bitten off. The scenario ends when the lizard runs up a tree. The turkeys can fly but I guess they feel less threatened when the lizards are treed. 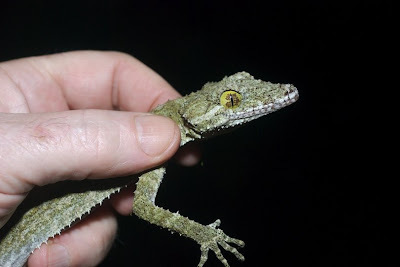 The Northern Leaf-tailed Gecko, Saltuarius cornutus, is probably found on our property but I have not seen it--or heard it. These large lizards (14 cm snout to vent length!) live in trees and emerge at night to sit and await unsuspecting prey. They seem to prefer geckos of other species. They have been found around homes where they prey on the Asian House Gecko. I have seen and heard similar species in Borneo where they do much the same thing. They are said to be quite aggressive if encountered in nature. 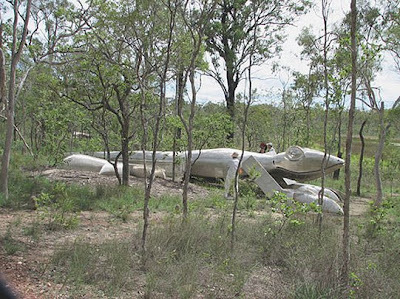 Imagine our surprise to find this structure at the Mareeba Wetlands, a marsh-lake habitat just to the north of Mareeba. A plaque states this stainless steel gecko was donated by a Japanese sculptor who places one of his creations wherever he finds native wild rice growing. Unusual to say the least. Nothing has been said to date on the lizard fauna in this blog. 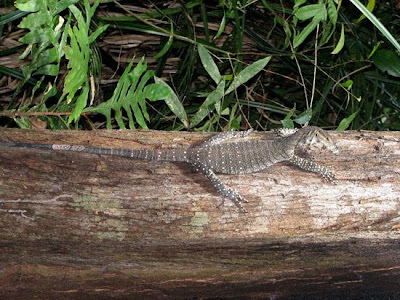 Kuranda has a nice selection of lizards ranging from some very small species to intimidating giants. Of interest to readers in the northern hemisphere are the different families that occur here that you won’t find in North America. Where the Iguanidae are well represented in the New World, we have no species in this family here. 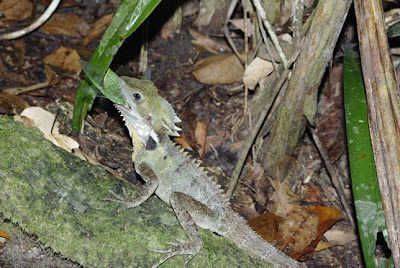 But we have “look-alikes” that you would easily mistake for iguanids that are in the family Agamidae. These are sometimes called “ecological equivalents”. But this should be used only loosely as we don’t know enough bout the intimate details of the life histories of these species to be certain they are really ecologically equivalent. Suffice it to say when comparing Old World and New World species that there are some that display convergent evolution, that is in some way they resemble one another but are not related. We see this in all groups, not just lizards. 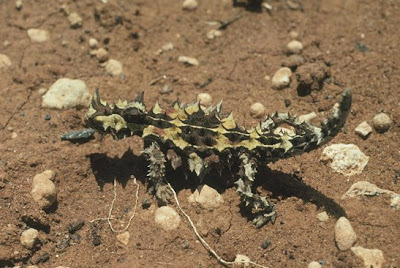 The Mountain Devil, Moloch horridus, of the Australian dry interior resembles a North American Horned Lizard but is an agamid, not an iguanid. However, like the North American examples, it feeds on ants. Similarly, our Boyd’s Forest Dragon looks like an American iguana but is unrelated. 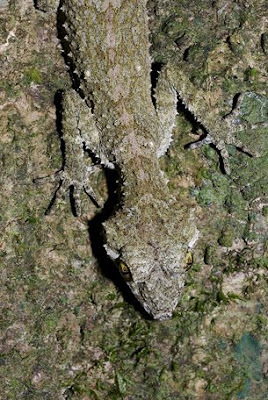 It is another agamid. 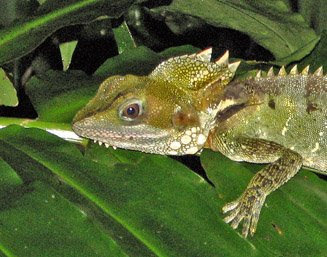 This Basilisk resembles Boyd's Forest Dragon to some extent. 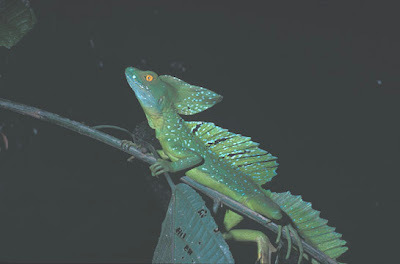 It is a member of the Iguanidae while the BFD is an agamid. I have been following a young lizard that returns from time to time to collect insects with me at the lights. It frequently spends the night on an adjacent palm frond but by first light, it is gone. I can tell it's the same individual because of its markings. As a young lizard a couple of years ago, it would come to the lights and sometimes scamper up the sheet eating beetles and moths as it made its way up. Geckos are more often heard than seen in the northern Australian tropics. 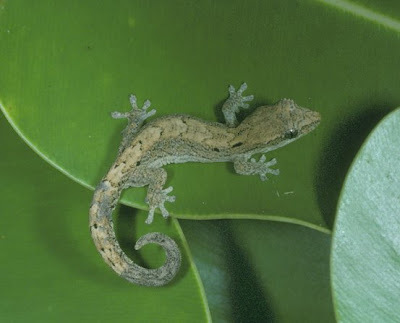 The Asian House Gecko occurs in and around dwellings. It has been moved around the tropics by commerce. In the house it performs a vital service in catching insects and spiders. It has a call that our Cockatiel imitates. They do this as a territorial display and in courtship. These lizards are wary and are not easy to approach even though they live in close contact with humans. They spend the daylight hours behind pictures or in drawers. Their eggs can often be found in folded clothing or behind books. Quite a successful lizard as far as adaptation is concerned. 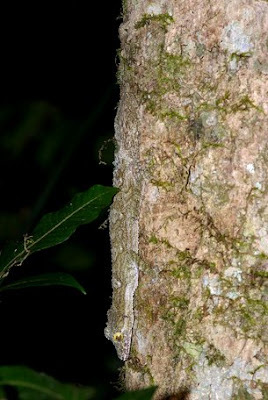 The gecko above is only similar to the Asian House Gecko. It is a native species from the Daintree region just north of Cairns. Skinks are not common lizards in North America but they are relatively common in Australia. You can find several species at any given locality. We have several at Kuranda. 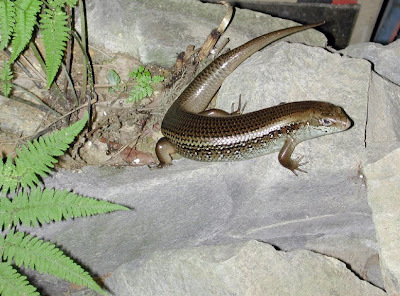 The smaller skinks can be approached and easily photographed. Carlia rubrigularis is aptly named. It can be seen on the ground in the sunshine. It seems common and is probably the food of many predators. This species is endemic to coastal rainforests. Egernia frerei, the Major Skink, is a large fellow with northern affinities. It has been found in southen New Guinea. It is shy and seldom seen for more than a few minutes. We think we see the same individual each time but we can't be sure. 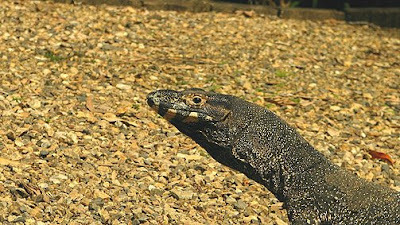 It has to be wary because of the number of potential predators ranging from Brush Turkeys and Butcherbirds to other lizards and snakes. 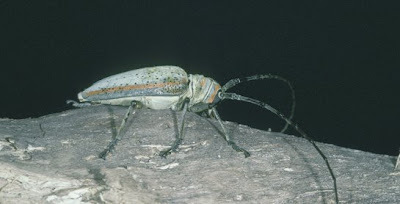 The larvae of cerambycids live is wood, mostly dead or dying wood. Of course, a rainforest provides ample habitat and this group is represented by dozens of species some small and others very large. The natural histories of most species are as yet unknown. And it is surprising that a group of such economic importance, and of appeal to collectors, Australian as well as foreign, that comprehensive guide to species exists. Meet Rosenbergia megalocephala van der Poll, quite a mouthful but a large an impressive longicorne that infrequently comes to our lights. 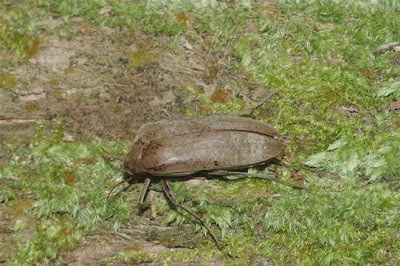 Platymopsis nigrovirens is an attractive species that sits on twigs during the daytime in a cryptic position. 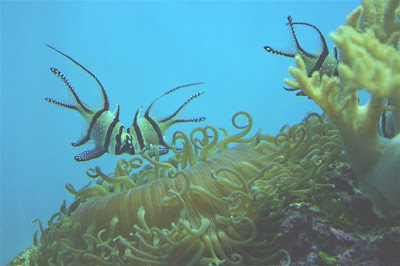 Other members of the Lamiinae, like the one below, do the same. 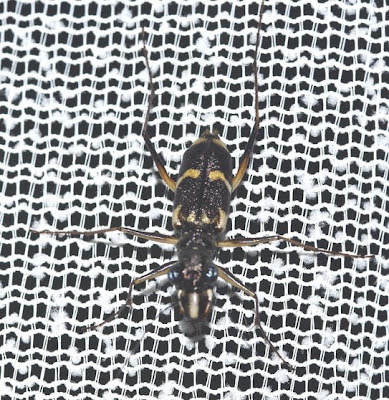 This is one of many lamiine cerambycids. It is a good example of protective coloration. This species of Phoracantha has a most peculiar resting stance. On a tree trunk it looks like anything other than a beetle. One of many unidentified species that frequents the Kuranda rainforests. This prionine will be familiar to northern readers as both Prionus and Ergates are commonly found in coniferous forests where the larvae bore in dead wood. In Australia also there are a number of species but their taxonomy is still to be done. They always attract attention when the buzz into lights. They have powerful mandibles and only the most adept of the Black Butcherbirds can make a catch without being injured. They seem to prefer these beetles over others at the lights. This may be just a reaction to the large size of the beetles but it may be something more. These beetles may be more nourishing than may of the others. In the first volume of his monumental 5 volume series on the Australian Weevils, EC Zimmerman states that “... the Australian weevil fauna contains more species than all of the Australian mammals, birds, reptiles, fishes and amphibians combined plus various invertebrate groups.” He felt the Australian fauna probably contained 1000 genera and up to 8000 species. 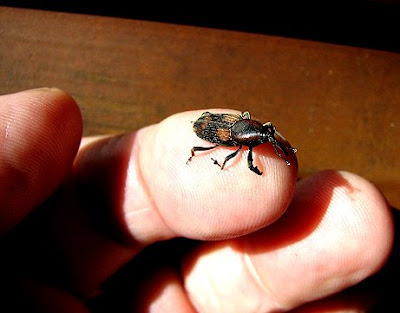 Weevils are almost everywhere, in almost all terrestrial habitats. There is a nice selection of species in the rainforests but you have to look for them. Many are in decaying timber, others in the leaf litter and in developing seeds and fruits. Most are very small and go unnoticed. A nice sampling comes to the lights and a few are presented here. 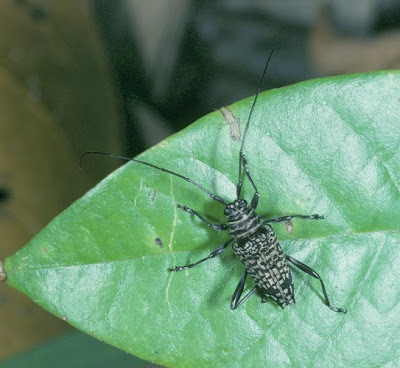 While the majority of species are in the weevil family proper, the Curculionidae, there are many in related families. Like the Brentidae and the Anthribidae. If cryptic coloration fascinates you, try to find the Dendropemon weevil in this shot. The family is best developed in areas of high rainfall. This is because they may feed on fungus. as Zimmie points out we really don’t know because the observations just haven’t been made. 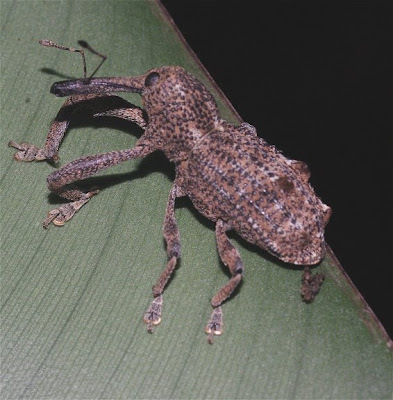 These odd weevils are represented in Australia by a few genera and not too many species. They seem to be primary wood-borers, boring in freshly felled timber where they probably feed on fungi. However, some are known to bore in living tissue and there is a cadre of species that live with ants. Ithystenus hollandiae (Boisduval) comes to lights in the wet season. Males joust with one another on logs. They guard egg-laying females as well. The majority of species reside in this family and range in size from the small species you find in birdseed or cereal products to some real giants in Australian woodland and heaths. The long-nosed Weevil, Sipalinus gigas granulatus (Fabricius) is a large and rock-like species that flies to the lights occasionally. It has long legs used to grip bark and twigs. In nature it often occurs in groups on suitable logs. the larvae can cause considerable damage to harvested logs awaiting processing. 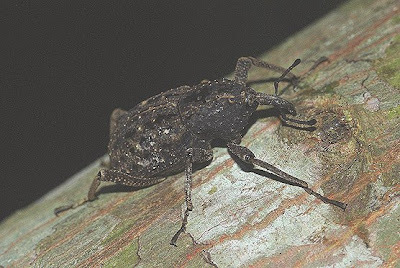 The New Guinea Sugarcane Weevil, Rhabdoscelus obscurus (Boisduval) is a pest of sugarcane and was probably introduced into Australia. Unfortunately for those who like to breathe clean air, the burning of the sugarcane prior to harvest probably helps to destroy the weevils. 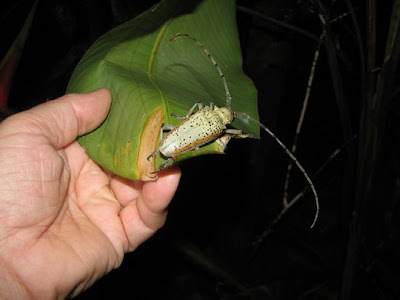 This weevil also attacks and kills palms. It is of concern to homeowners and horticulturists because of the devastating effects it can have on ornamental palms. By the time growers notice the problem, it is too late. The larvae tunnel in the tissues and eventually kill the palm. Leptopis malefictus (Lea) flies to the lights on the odd occasion. It is in a large genus with species all over the country. It is often associated with acacias. Zimmerman, E. C. 1993. Australian Weevils (Coleoptera: Curculionoidea) Volume III Nanophyidae, Rhychophoridae, Erirhinidae, Curculionidae; Amycterinae, Literature Consulted. CSIRO, American Entomological Society, pp 1-854. Zimmerman, E. C. 1994. 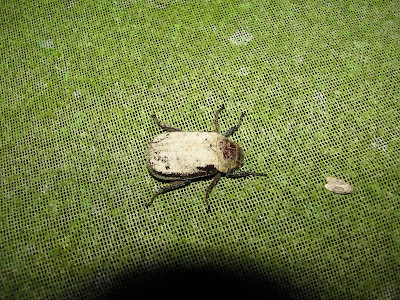 Australian Weevils (Coleoptera: Curculionoidea) Volume I Orthoceri Anthribidae to Attelabidae The Primitive Weevils. CSIRO, American Entomological Society, pp 1-741. Each morning there is an array of beetles of many species at the light sheet. The species component varies with the season and flowering and fruiting of the vegetation. As with all insects, each has a particular biological story. Many we are yet to unravel. Here are a few highlights. Many scarabs come to the lights, some apparently from great distances. 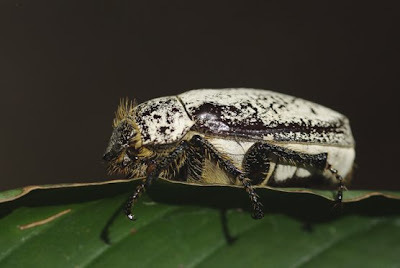 Here we have the Grey-backed Cane Beetle. 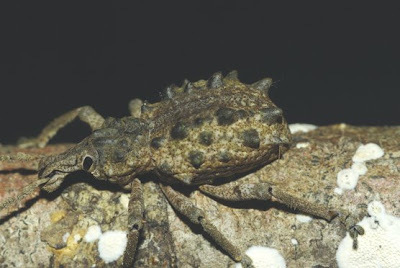 This large scarab is a pest of sugar cane and is responsible for the intrduction of Australia's greatest pest since the introduction of the "white"man', the Cane Toad, Bufo marinus. 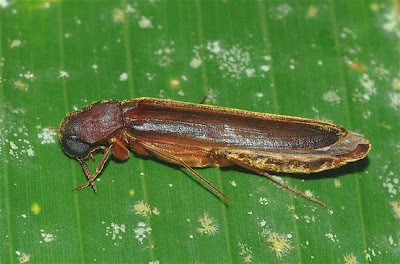 This beetle attacks sugar cane from beneath. The grubs feed on the roots causing considerable damage to the crops. Cane toads would never encounter the grubs since they only burrow in the colder months to sleep. They would only encounter the adults on a chance basis since the adults are airborne most of the time and seldom come to ground. In general, one of the least likely places you would encounter a Cane Toad would be in a cane field. They avoid dense plantings. This is true to some extent o the rainforests. They only occur there when times are tough and food is scarce. Normally you would not encounter Cane Toads in rainforests. 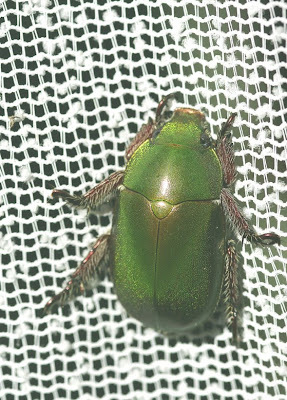 Green scarabs, like this one, Anoplognathus punctulatus, are frequently found on the light sheet. Interestingly, they are not picked off by the several species of birds that arrive every morning at day break for their breakfast. Are they distasteful? Or is the search image on the sheet one that the birds just don't recognize? One of a number of green scarabs found at lights in the wet season. 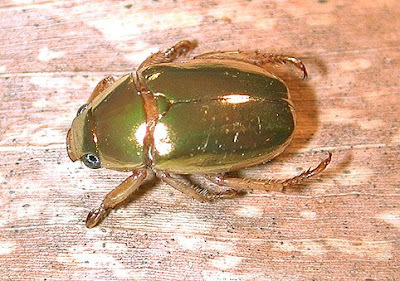 Anoplognathus aureus is one of a number of species called Christmas Beetles. This little jewel apparently deceives predators by appearing to be a spot of reflected sunlight on a leaf. I took this photo of a scarab similar to A. aureus in Costa Rica. It is unrelated and is a great example of convergence. 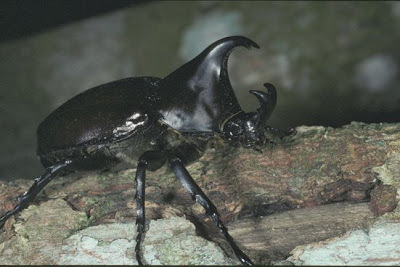 The Rhinoceros Beetle Xylotrupes ulysses australicus (Thomson) is common along the coast from Sydney to southeast Asia. They always attract attention when they are found at lights. Males have an elongated horn that is used in jousting with other males. 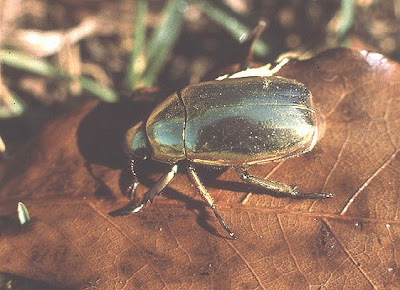 These beetles are often kept as pets in Asian countries. They are easy to keep. Adults feed on a variety of fruits and the large grubs can be raised on leaf litter with a generous supply of dry dog biscuits. Tiger Beetles (Carabidae; Cicindelinae) are usually encountered along ocean shores or along streams. 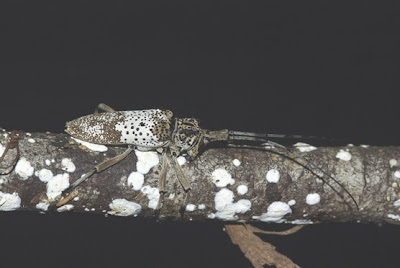 There are a few, like Distipsidera undulata, that occur on tree trunks where they hawk passing insects. This one is an infrequent visitor at the light. 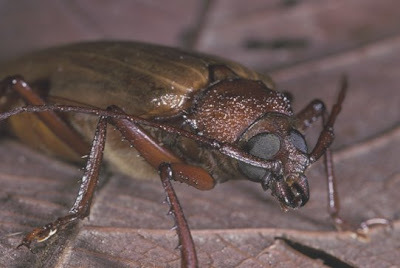 Rhipiphorid beetles are special--but they don't look very special. Females are usually wingless and lack mouthparts. This suggests something special. They are parasites of other insects. This one is probably Rhipidioides and is probably a parasite of cockroaches, and probably those in the family Blaberidae. [If you're into cockroaches, this is the place. I've found about 70 species here, mostly in the Blattellidae]. 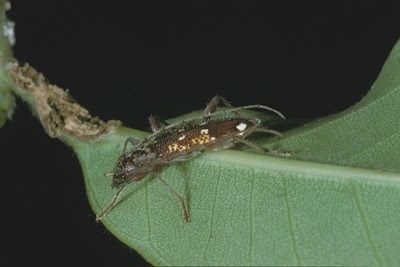 The first instar is a triungulin larva that travels around at a fast rate looking for the appropriate host. 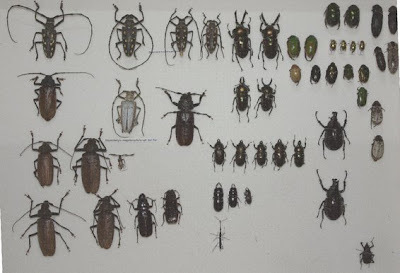 Hosts of other genera include wasps, bees, flies and some other beetles. 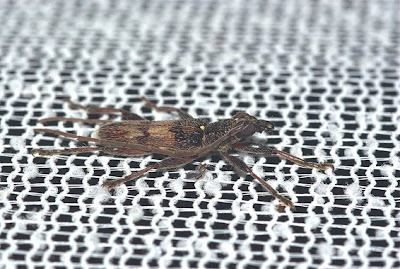 Melitomma sp. 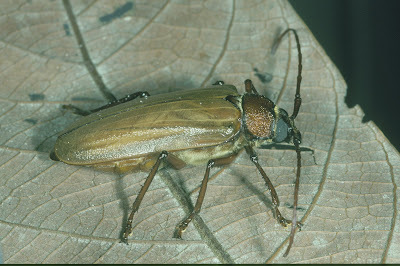 is a member of the Lymexelidae, another beetle family with somewhat peculiar habits. The larvae are wood-boring but feed not on the wood but on the ambrosia fungi that grow on the walls of their burrows. Females have pouches near the end of the abdomen where they store the fungi that are later deposited with the eggs. When the eggs hatch, the young larvae "infect" the walls of their new burrows with the fungi that grow and nourish them. 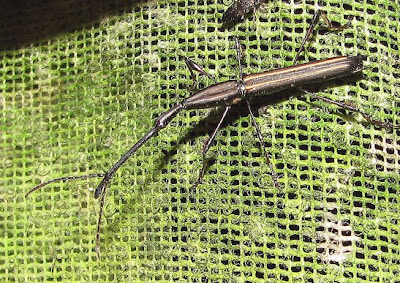 Longicorne Beetles (Cerambycidae) range in size from beetles a few millimetres long to some giants over 70 mm. The larvae bore in wood, roots and other plant material. It is a large family and being in a rainforest you would expect an impressive array of species. And such is the case. 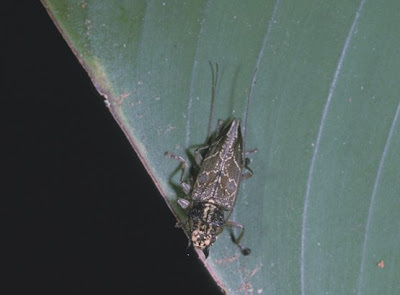 Coptocercus biguttatus is one of many in the genus. They are distinctively marked and come to lights or can be found on flowers during the daytime. Many longicornes assume unusual patterns at rest. This is to deceive potential predators. 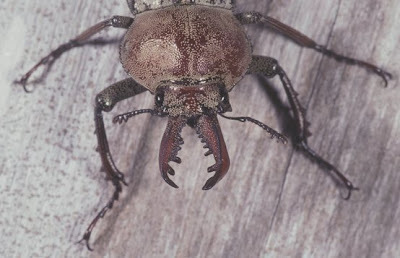 Being wood borers, most species possess formidable mouthparts. It is always intriguing to watch the assortment of Black Butcherbirds, fantails, robins and the inimitable Brush Turkey, attack beetles in the morning. One bite from the beetle could snap off a toe or remove the tongue of the bird, but I have never seen a mishap. The birds know how to approach the resting beetles and they take precautions. In late October the Cairns Post Newspaper published an article and photos of a rather astounding natural occurrence. Mr Les Martin of Atherton (not far from Cairns) photographed the Golden Orb Weaver, Nephila sp., with a bird it had captured in its web. For the uninitiated, the Golden Orb-weaver is a very large spider. It’s web often measures ¾ of a metre across. Females perch in the centre of the web on-guard for any catches. The web is notable on two accounts. It is a golden colour when see in the sun- hence the name. But is it extraordinarily strong. You can rest your arm across the top of the web without damaging it. The occupants, of course, are unimpressed with this activity! Golden Orb-weavers always attract interest. I have always been surprised at the reaction of the public when one appears in the garden. They are always greeted as long-lost guests and left to their own devices. Other spiders are either ignored or sprayed out of existence. It might be that these spiders appear suddenly and then, for some reason, they just don’t show up again, sometimes for years. 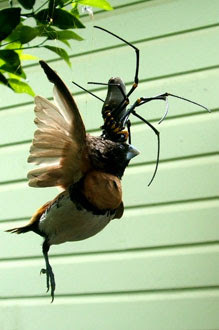 Golden Orb-weavers have an elaborate life history. The giant females are always accompanied by the minute males. These males take their life in their hands (or legs!) and live at the outer reaches of the web and wait patiently for their “15 minutes of glory” either before which or shortly afterwards they are consumed by the female. Other spiders such as de-drop spiders and pirate spiders also live commensally and feed on smaller insects that Mrs Orb-weaver ignores or has missed. But occasionally they themselves wind up as the meal! But I digress. 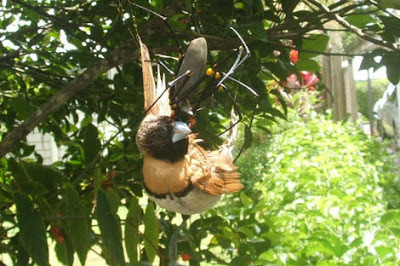 A bird-eating spider! Yes, and this is not the first incident. Barbara York Main (1976) notes the wrens and silvereyes can meet their fate in the webs of the Golden Orb-weaver. But because of the habit of the spider of sitting in the centre of the web, the spider often meets its fate at the hands of a hungry bird. This seems especially true late in the season up here (May) when the Black Butcher Birds seem to seek out Golden Orb Weavers where they had ignored them for weeks and weeks prior to this time. The bird appears to be the Chestnut-breasted Minnikin, a fairly common finch in the northern tropics. Main, Barbara York (1976). Spiders. The Australian Naturalist Library. Collins, Sydney 296 pp. Well that’s not a word in your dictionary but perhaps it will be there in the future. The launch of a fine new book in Cairns and Kuranda recently is a triumph of science, art and information technology. In her “Forewing” (Foreword) the Queensland Minister for Tourism, Regional Development and Industry and the Member for Cairns Desley Boyle notes the historic importance that Butterflies and Moths have had to the Kuranda area. It started with Frederick Parkhurst Dodd; the Butterfly Man of Kuranda (see May 2006 in this blog) and continued with the Australian Butterfly Sanctuary opened in 1987. This book is another milestone. It concentrates on the marvellous moth fauna of the area. Buck Richardson, the author combines a fascination for the unusual with a flare for art and curiosity. He has a diverse background including artistic innovation, acting, writing and digital art. Minister Boyle points out that the book is full of neologisms—beginning with the title and continuing with terms like “Forewing”, “Mothing” “Morthematics” and “Moth-er”. The first part of the book consists of observations of moth biology seen through the eyes of an artist and non-entomologist. There are some real gems there such as a non-standard observation of why moths are “dis”-tracted to lights at night. Then there are 27 pages of moths, beautifully represented and authoritatively identified. For the taxonomist and local naturalist, this is a wonderful addition as well as a thing of beauty. The images have been photographed at various places around Kuranda, mostly under streetlights. Buck has become known for his early morning forays around Kuranda streets wherever moths might be found. The images have been modified, but not greatly changed, digitally. Then, the art. Moth images have been used in still life exhibitions, “Space Mothology” on and off canvas “Moth Air Balloons” and new concept for “Moth Balls”, “Moth Eggs” “Moth-erland Orbits”, “Moth Stars” and “Moth Mandalas”. All have to be seen to be believed. And all of the latter are on offer as wall hangings, posters, wall plates, silk scarves and the like. In viewing this collection one has to keep in mind that all the designs are the moths themselves, all digitally arranged using Buck’s talents as an artist. This book should be on everyone’s coffee table as a triumph of science and art. It is beautifully produced and a thing of great beauty. We are privileged to have such a talented person in our community. “No moth has been harmed during the production of this book!” As a collector, well I have mixed feelings about this. He let go some very nice specimens! A couple of Moth Mandala wall plates. Remember all these are moths. Look closely, you'll see. 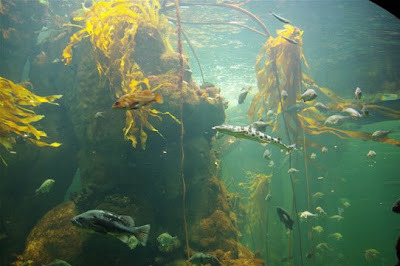 The California Academy of Sciences, San Francisco, was established in 1853 as the California Academy of Natural Sciences. It was given its present name in 1868. In 1874 the Academy moved into the old Congregational Church building on the corner of Du Pont and California Sts. This was the first museum in the city. In 1891 the Academy moved to 819 Market St in the heart of downtown San Francisco. But in 1906 the building was destroyed in the earthquake and fire. Most of the displays and collections were sacrificed to the fire, however, a few, such as the dragonfly collection, were saved because they were on loan for study to scientists elsewhere. Alice Eastwood physically rescued a portion of the plant collections from the fallen buildings. The Academy as it was in 1853. 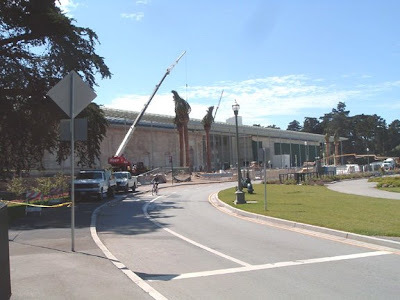 In 1916 North American Hall was opened in Golden Gate Park. This housed Wild California, Mineral Hall, a Bird Hall and the Invertebrate Zoology & Geology Department. This hall was closed in 1989 after a severe earthquake and this eventually led to the decision to establish, new and safer premises. In 1923 Steinhardt Aquarium opened including a number of outdoor pools in the front courtyards that housed seals, river otters, sharks and the like. These were eventually closed when the Academy was further enlarged in 1969. In 1934 African Hall was opened and this also housed administrative and other offices. There were many other additions over the years but the biggest change occurred in 2003 when the Academy closed and reopened in temporary premises, again in downtown San Francisco, at 875 Howard St. The Board had taken a decision to completely level the old premises which were considered unsafe and the aquarium was in severe need of repair. Steinhardt Aquarium in 1923 with the seal pools in the foreground. Simpson African Hall in 1934. Note the similarity with the present reincarnation. Many of the “old timers” like yours truly, were very skeptical about the demolition. 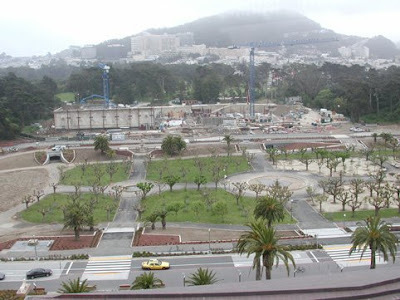 The old exhibits, the dioramas, the Alligator Pond and the ambience would be gone. The pleasant quarters that housed the scientists were to be demolished and the collections put in storage. We feared they could never recover the ambience and the collections would suffer. 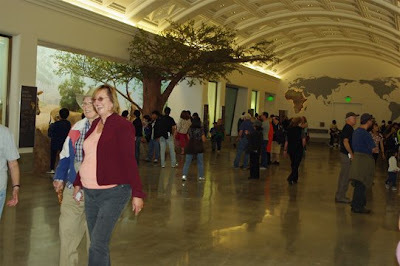 Well it was with some trepidation and great skepticism that we returned to the Academy on 27 September 2008 to attend the Grand Opening of the new 466 million dollar California Academy of Sciences. There were more than 15,000 other interested souls who turned up early for the 9.00 am opening. Once inside, our fears were dispelled. Renzo Piano, the architect, had blended the old with the new. The ambience of the old place was preserved and there were plenty of exhibits that assuaged the fears that the past would be lost. The Alligator Swamp was much the same as it was but you could now go downstairs and view the occupants from an underwater window. The Alligator Gars were back. African Hall looked much as it did before but had an exhibit of live penguins at one end and a herd of moving elephants in one exhibit. The Gorilla was standing tall and proud in familiar surroundings and the planetarium, although much different from before, was in approximately the same position as it was in the old Academy. And Foucault’s Pendulum was back. 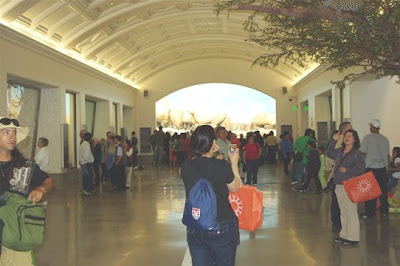 There were many new exhibits, the most imposing of which is the Rainforest Dome. This provides examples of rainforests of the world with Borneo, Madagascar, Costa Rica and the flooded Amazon featured. The roof of the Academy also serves as a display and a functional way to help cool the building. The architect has designed this “eco-roof” to emulate the Seven Hills of San Francisco and adorned them with a 2.5 acres with Californian annual and perennial plants. These plants are already attracting local bees and birds. There are pleasant restaurants and café’s in the building and one which will be open for nightly dining. There are many more innovative exhibits that I could go on about in detail. Suffice it to say that the public and school children of the San Francisco Bay Area will be well served by the new Academy. The opening day crowd is testimony to the community interest in the Academy. My only gripe has to do with the gift shops that are within the Academy. One would expect that you could purchase almost any book on natural history or nature DVD’s at a place like that. Instead there are very few books and a plethora of stuffed animals, rubber alligators, ear-rings and other jewelry. In brief, the shops are not unlike any of the cheap import outlets that one finds in San Francisco’s Chinatown. One hopes the Academy will rectify this situation, although, from the looks of things, those items are of considerable interest to the general public—all things that children don’t need! 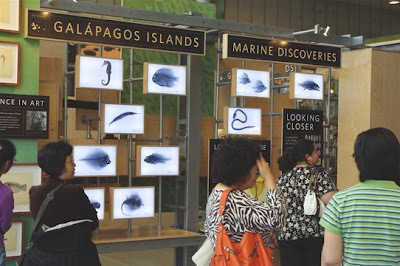 But I digress, a visit to the new California Academy of Sciences is well worth the visit and it will b most likely that you will w3ant to return over and over again—just like in the old days. The front of the Academy on opening day 27 Sept. 2008. The glass panes above are actually solar heaters and should contribute 10% of the Academy's needs over the years. Entertainment for the waiting crowds on opening day. 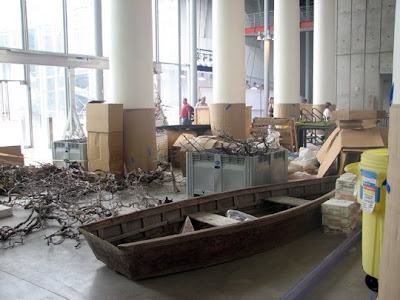 In late August 2008 there was still much work to be done. 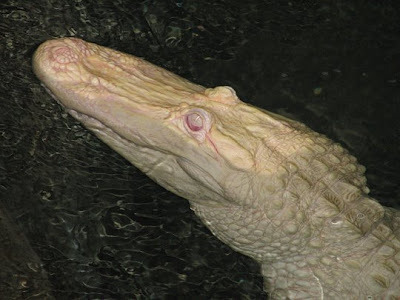 An albino alligator is among the first living creatures to greet the public. 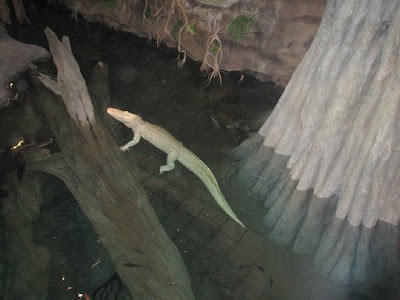 The Alligator Swamp can be viewed from below. Snapping turtles and a mixture of fish including Black Bass and number of cichlids add interest to the exhibit. The new aquarium is even better than the old one with many more thoughtful exhibits. Children are already drawing the inhabitants of the Big Tank. 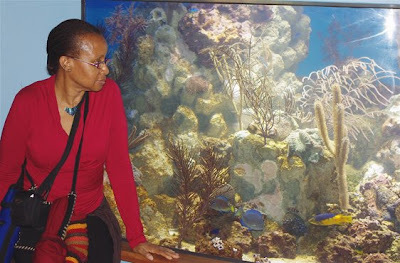 A walk-thru tank provides a closer look at marine fish. A tank of damsels is always a delight. 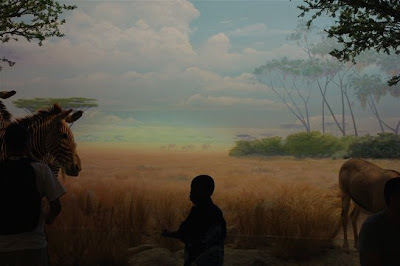 The New African Hall is very reminiscent of the old. Virtually everyone was happy with what they saw. The "Altered State" area deals with climate change in California-a relevant current topic of interest. "Islands of Evolution" takes up the field of evolution that even an "Intelligent Design" advocate can master. Both Madagascar and the Galapagos are used as examples. The Academy has long history of study on both of these areas. The Rainforest Dome is one of the new innovations at the Academy. 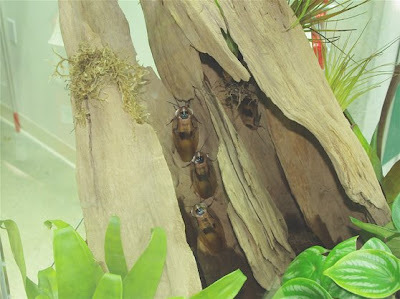 Birds, Butterflies and many living plants are the highlights of this themed exhibit. Many of the visitors are keen on photographing as much as possible. The Dome highlights three rainforests, Borneo (lower level), Madagascar (middle level), and Costa Rica (upper level). This water feature is very impressive. At each level there are appropriate exhibits. Madagascar Hissing Cockroaches are well known around the world. They are sold in pet shops as exotic pets. This model of a giant Rafflesia flower illustrates a hightlight of the Bornean biota. See earlier offerings in this blog for more on Rafflesias. This tanager pauses to contemplate the onslaught of visitors. 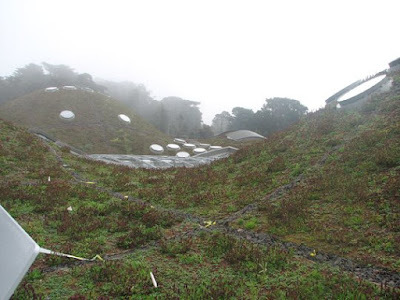 The "living roof" of the Academy will be kept alive by the natural fogs of San Francisco. Already bees, other insects and birds are visiting the flowers. The layer of local annuals and perennials provide insulation to the building. Eating at the Academy is a fun experience. Much more can be said about the new CAS. It will be a highlight for any tourist visiting San Francisco. An icon has ben restored to the city. The old photos of the Academy are from a website with many more nostalgic photographs of the early CAS.